American made soy candles are pretty easy to come by, but Vance Family Soy Candles have always been a USA Love List favorite. The scents rejuvenate because they're made with essential oils. These candles never smell fake and they burn cleaner because they are made with soybean wax. 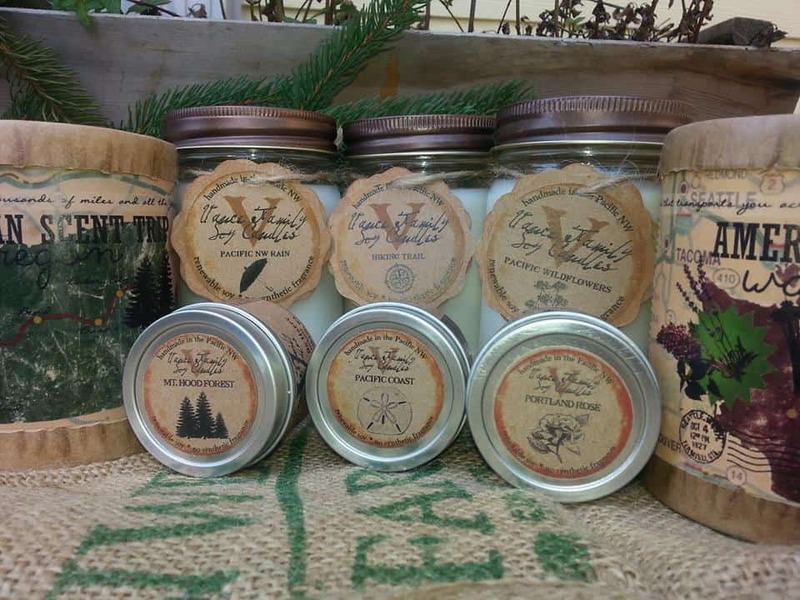 Unlike most mass-market candles, Vance Family Soy Candles uses non-GMO, biodegradable soy wax to make all of its candles. That means that they are plant based, sustainable, synthetic free candles, made with organic essential oils – no dyes, no petroleum products, and no phthalates. They burn with low smoke, from cotton or paper wicks, packaged in heavy recycled glass. All of the packaging and products used in these candles are American-made and they donate at least 10% of profits to charity. By the way, they smell like a dream. Lucky for you, we're bringing you another chance to win a collection of your own. $245 worth of them, to be exact. The prize pays homage to the company's roots. All its candles are made in Washington state, and the Scents of the Pacific NW candle prize package celebrates the culture, attitudes, and scents of the region. Click the arrow buttons below for further instructions on each entry. This giveaway will close at midnight on Thursday, September 10. The winner will be randomly selected, verified for correct entry participation, and notified by email. Disclosure: This post is sponsored by Vance Family Soy Candles which USA Love List is proud to share with you because, sponsored or not, we only share stuff we love. What an amazing looking product. With two chocolate labs, we need a whole lot of candles in our house 🙂 We love soy candles and we love using US made products. I have not heard of these and would LOVE to give them a try! Thanks for the opportunity to do just that USA Love List! never heard of them – would love to try them out! 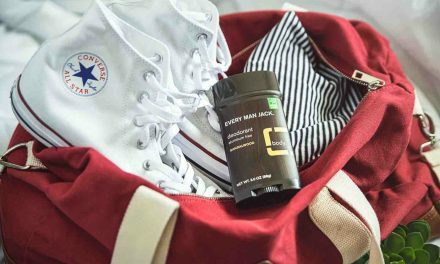 American made & interesting scents? What’s not to love. I would love it because it is natural and GMO free. I would love to win because I love scented candles and burn them all the time. I just really like that these candles are Soy and USA made. I am a big fan of scented candles and I burn them almost every day. I normally burn them in the kitchen so that they can flow through the rest of the house. I love candles and am very excited aout this selection of soy candles. I use them in the bath to relax and read. I’d love some new candles. We use ours a lot. I want to win because I love candles, and these look amazing! We love candles… any kind of candles. We want to support Made in the USA too. over $245 in candles!? Yes, please! I would use some for Christmas gifts — everyone on my list loves candles! I give scented candles at Christmas. We also use them in our bathrooms year round. I’d like to win so I could light these when company comes over. I would like to win because I love using candles in my home and this collection would be great to have since its made in the USA! I love using scented candles to create a certain type of mood in my home! I would love to win because I want to switch to Soy candles to avoid the nasty chemicals that are in traditional parafin wax. These look really awesome. I love these different scents. I think the candles that have state scents sound really fun. Like for Washington state they have fir, lavender, lilac and apple. All of which remind me of Washington. Love it. I have candles all over the house, especially the bathrooms and the kitchen! I love clean burning soy. Cheap candles have that terrible black smoke! I’d like to win so I could enjoy some new candle scents. I would like to win because I love candles and I burn them all the time. I use candles all of the time. I usually burn them in the kitchen and you can smell them all around the house. I would love to win because these are made with Non-GMO Soy. I love this. My family does not eat GMO’s so why would we want to breathe in GMO’s. I love that this company is staying Non-GMO. WHOO HOOO!!! I love that these are made with pure essential oils and organic flavor oils. What better way to infuse a scent. No synthetic chemicals needed! Your blog is a great idea! Thank you for encouraging local small businesses and for the giveaways! 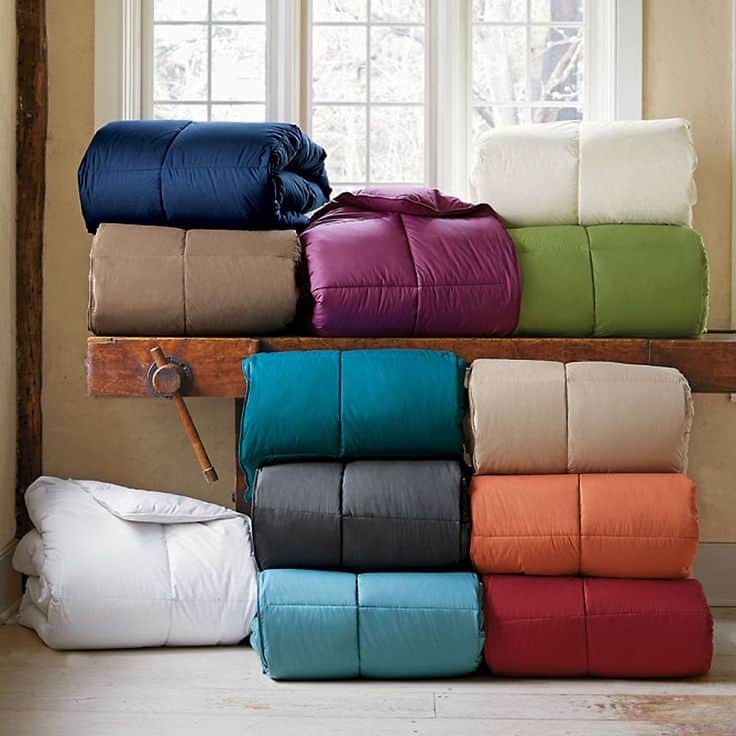 These would make a great gift for my mom — she loves candles! I use candles all over the house and outside, too! Yes, I do give candles as gifts. Everyone can use candles. I would love to win these because I am learning more and more about how superior these are to other candles. I love that you can compost left over wax. That says a lot! I burn candles often in my home. I love the way they look, and I love the scents. I like when people enter my home to comment on how nice my house smells. I want people to feel “welcomed” by the warm glow, as well as the wonderful scents. They have so many variations — jars, tins — something for everyone! I’d love to win so I can try these candles. They look really great. I really like scented candles and I give them as gifts as well as use them at home. I do like soy candles, they leave little, if any, soot. I like that they burn clean. I want to win because I burn candles all the time and they have some great scents. I would love to win because the more I look at their site the more amazing products. I am currently loving the Hand Blown Glass Lanterns. GORGEOUS. These are true works of art, but also have a great function. Amazing. I have a friend that is allergic to a lot of scents and general candles. I would love these because I would bet that he would be able to use these, since they are not made with synthetic crap. He really misses being able to burn candles and not have his asthma kick up. I would like these to use as gifts for Christmas! I am a big fan of scented candles but my husband is a bigger fan than I am. He loves your candles. I have a standing tradition with my brother-in-law, every Christmas I get him a new and different candle. He loves them too. We always have candles burning in the house year round. I love them Christmas scents during the holidays. I would like to win because these scents sound amazing! I love soy candles and these look rustic and very cool. Thanks for the chance! I have a mantle that is just begging to have some beautiful candles on it. It would make my house look fabulous, and smell fabulous too. I love all natural candles and soy candles especially because of how cleanly they burn! I use scented candles all the time to help my home smell nice, and I absolutely think candles make great, thoughtful gifts. I would love to win becausse soy is natural and burns cleaner and is also much safer than wax candles. I have 5 cats and do cat rescue so yes I am a HUGE fan of scented candles they work much netter to control, odors than spray scents. I love the Wedding & Event Favors! I’d like to win because I love soy candles and the scents sound wonderful. I like to use candles in my home because they create a warm and welcoming feel. I also like to give candles as gifts for birthdays and Christmas. 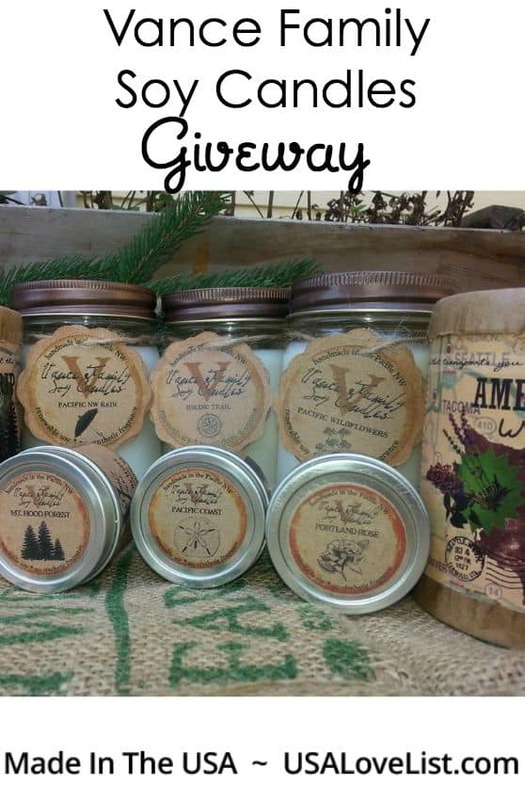 I would love to win these candles because I love candles and soy candles really do burn so much cleaner. I do buy cheaper candles with different ingredients, though I prefer soy and essential oils. Why would I love to win? I burn a lot of candles for the scent and ambience in winter. It is so lovely to get a nice scent going. Welcoming and soothing. These candles seem VERY nice. “Can throw any leftover wax into your compost pile!” That sounds good to me. Not that there will be any leftover! Why YES yes yes I use scented candles, I’m a huge huge fan of them. I love the idea of natural soy wax. I am a tree hugger too and natural is always the better way to go. I love all of the different scents that they have. I love that they make most of their products in the USA, and are GMO free. I love to support small businesses. I adore scented candles. They make my house smell welcoming, esp. with a dog and 4 boys in the house. I would love these for myself and for gifts! I’m trying to avoid all toxic chemicals in my home, so these candles would be great! Scented candles are all throughout my house – these seem great because the smell isn’t too overpowering – a bonus! I went to Walmart today and was in the candle section. 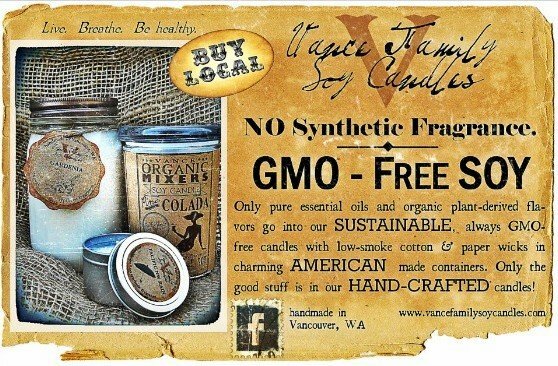 I looked through each and every candle, and not one of them was made with SOY, let alone GMO free Soy. I would love to win this to have great candles for my family. Like I just mentioned I was at Walmart, and was looking through the candles. I also smelled the candles to see if I could find something that I would like. NO. Now that I am aware that Vance Family candles are made with essential oils, I am not sure I will ever be able to settle for the chemical scents. I adore soy candlles.. they burn sloower and more evenly and are from a renewable resource. I want to win because this company is awesome. I love all the time and thought that went into their products. Not only do they use Non-GMO ingredients (THANK YOU) but they also use recycled glass containers that are made in the USA. How cool is that! I just found the Organic Holiday Mixers and the Nutty Irishman Coffee was made for me! Love it! I would love to win becausse soy is natural andit burns cleaner and is also much safer than wax candles. s I am a HUGE fan of scented candles they work much better to control, odors than spray scents. I’m originally from California, and get homesick from time time- I hope some of these scents take me back! They all sound like scents I’d love. I adore scented candles and use them a lot during the fall and winter to make my home seem cozier. Great gifts for my friends! I love that they will private label. So cool for events and such. I’d love to win this collection of candles because it would make me so happy to place them around our home to add fragrance and mood lighting. I want to win because I want to try some of these amazing scents. The Keep Portland Weird, sounds like such fun. I also love that proceeds go to the Oregon Music Hall of Fame. I would love to win because I would love the opportunity to show all of my friends and family that Non-GMO candles exist and can be used with less concern for what GM ingredients will do long term. I would love to win becausse soy is natural and burns cleaner and is also so much safer than wax candles. I have animals, so candles keep thibgs smelling fresh and not all ‘catty; or ‘doggy’ thats nice. I want to win because I love that I can just wash out the candle jar and use for a cool drinking glass. That is really neat. I can’t believe the candles have such a long burn time. One stated it went for 75 hours. That is awesome!!! I would love to wn so out house smells nice I especially like the natural sounding fragrances. Yes we love candlse and I prefer soy over wax for sure. I thiink they burn better and more cleanly. We simply love candles and having natural candles are even better. We always try to find ways to protect the environment and this is a great addition. Well, it has happened…it is unofficially fall. I can tell. I live in a cold region and the leaves are already starting to change. Tonight it is going to be in the 40’s! So, I would love to win so that I can have the warmth and scent of a nice candle flickering on my mantle. I would love to win so my house smells nice and inviting. I do cat rescue and its nice to have candles sometimes! I love candles. I love the scent and how inviting it makes your home. I love hoow a nice candle can make you think of fall or of whatever scent it has. I’d like to win, because they are natural candles. It is so hard to find made in USA anything. I so support this. If we only bought USA, and the manufacturing was done in the USA, a lot more people would have jobs…in the USA. Hey, I love my country and it’s people. I would love to try them out! 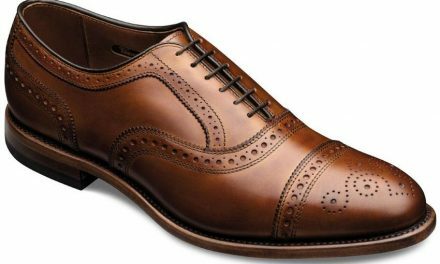 They’re made in the USA, they’re soy, and they look great! I would like to win because I want to show people how awesome USA made products are. I cannot believe (well actually I can) that the FDA considers synthetic fragrances to be toxic. But yet, they remain in candles, burned in homes for people to breath for hours on end. Yuck. I am so happy that Vance Family exists and provides people with essential oil scented candles. I think the scents sound so nice. I am really excited to try the Peppermint Farm. It just sounds perfect! Yes we love candles I prefer soy over wax for sure. I thiink they burn better and more cleanly. I also think the scent is better than wax. I love scented candles. If they are soy or with natural ingredients the most important things to me are scent and long burning. I’d love to win because I am very much interested in candles. I love that these are USA made and that pure ingredients are used! I enjoy using candles because I love having a pleasant scent in the air. I also use them to cover unwanted odors. Why would I like to win? Who doesn’t like to win!! I could divide them up and give them as stocking stuffer’s at Christmas. I have a lot of allergy’s, so I have to be careful when it comes to scented things. I hope soy would be ok, but my nieces burn candles all the time. They would love it if I’d win! I think it is really neat that you can have your company, or a wedding idea, can have candles made just for your party/event. This would be really fun. A Non-GMO candle given away at a wedding would be such a fun reminder of a great day, every time the candle was used.